Hello beauties. I hope you are all having a great weekend. Today I thought I'd share my current nail polish. A while back, I stopped by Flormar looking for an eyebrow pencil to try out and while I was there I obviously got interested in a few more bits. One of which was the Neon Yellow nail polish and the other was the Mattifying nail polish. I have wanted both of these for a while and was so glad to finally get my hands on them. So as soon as I had a minute, I painted them both on my nails and I am loving it! Don't they look lovely?! My nails are so bright and matte, I think they draw a bit of attention to them. Which I have no problem with since my nails are currently very healthy, strong and long. I cannot wait to try the matte polish on more colours. I'll post reviews after a few tries of both nail polishes. 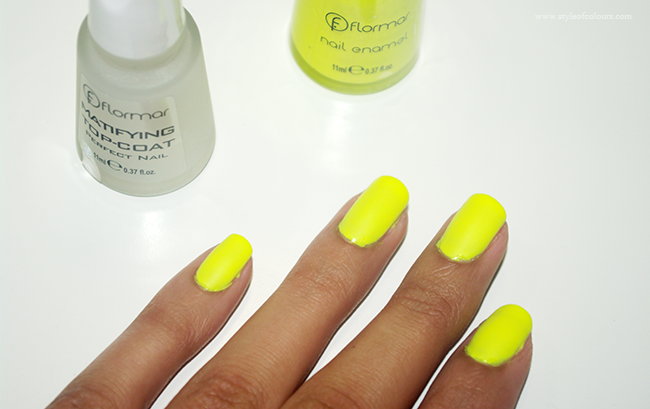 Are you brave enough to wear neon yellow nail polish? Love yellow in art nails! kisses and happy weekend! Oh that's a dangerous ground for me. I can't enter a Flormar store, without buying a nail polish. ok, i'm totally being dishonest right now - SEVERAL nail polishes :P I really like their max growth base coat. And i think i'd wear a neon matte polish like this. I'm up for any crazy nail color. Because, why not - right?! I know what you mean. In Riga I usually used to go to the Flormar stand in Prisma in Riga Plaza, but the polishes are cheaper there. Think I might actually have the max growth one you're talking about. :) Want to try neon orange?